Guava is one of my favourite fruits and the red skinned fragrant guavas of Allahabad are the best. 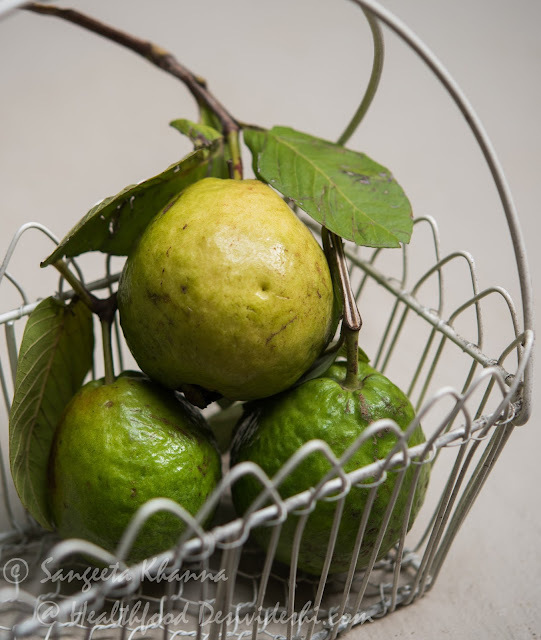 There are so many varieties of guavas in India that every city can surprise you with a new variety or a different flavour bouquet of the same variety. 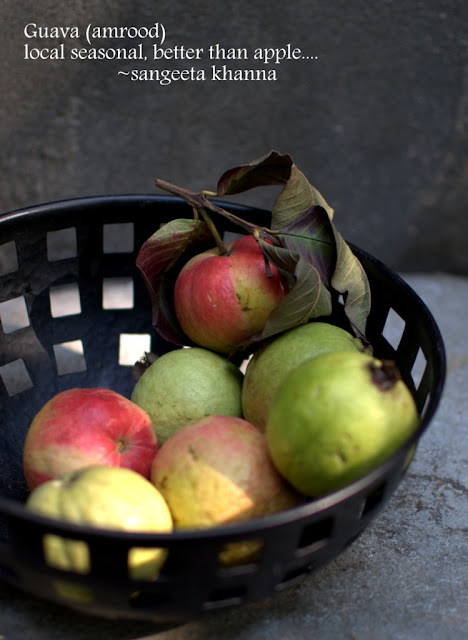 Every second Indian household would remember a guava tree in the vicinity or in the backyard and almost every stage of the fruit is used to make something or the other, the fruit at its prime is the most delicious. Guava has always been touted as the fruit for good skin, because it keeps the digestive system clean and toned. But there is much more we need to know about guavas. I have mentioned in the past how cooked guava helps relieve chronic cough and throat and chest congestion. This guava soup can be a great relief from chest congestion. In older times guava was roasted in dying embers and was eaten with rock salt to relieve chronic phlegm. I have seen it works even if a soft ripe guava is cooked over gas flame or microwave. This guava soup also helps the same way. I have had the experience of using guava leaf infusion to treat toothache. The leaf infusion works wonderfully as a mouthwash too. I remember my grandmother used to say that guava datoon (natural toothbrush made with freshly plucked twigs) is better than Neem datoon when you have toothache. No wonder I see some studies suggesting antibacterial activity of Guava leaf extract. 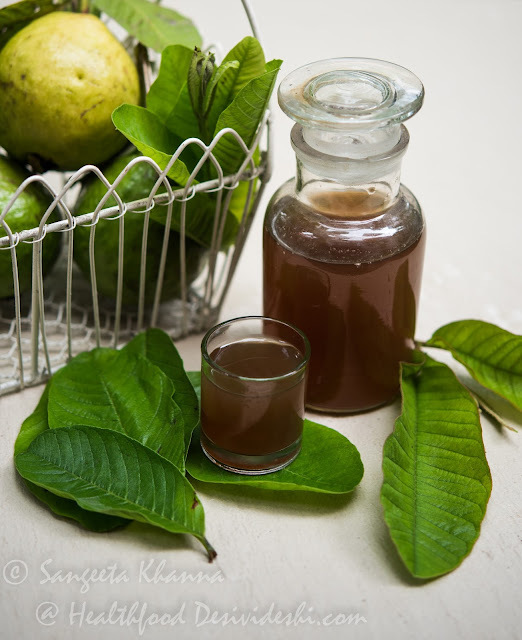 If you boil 2-3 leaves of guava in a cup of water and pinch of salt, it can be used as a mouthwash to treat toothache and any inflammation of the gum. We need home remedies like this as the commercial mouth wash will have some unnecessary perfume, some colour and even some for of sugar as well. And if you roast a fully ripe guava over embers or gas flame and eat the pulp with a sprinkle of black salt and pepper powder, it can relieve chronic congestion that remains even after a course of antibiotics sometimes. Here are more ways of using guava fruits and leaves to treat common ailments. 1. 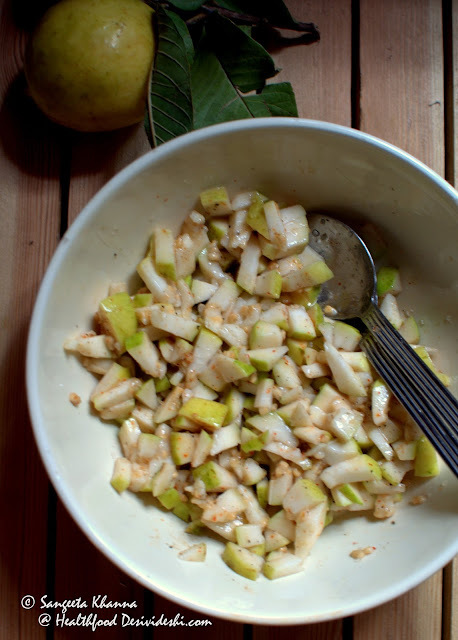 Raw guava makes excellent digestive chutney when mixed with ginger, green chilies, cumin seeds, black rock salt and some mint leaves together. Just mix these together and pulverize to make a coarse chutney. Serve with any Indian fried snacks or as a side dish. 2. 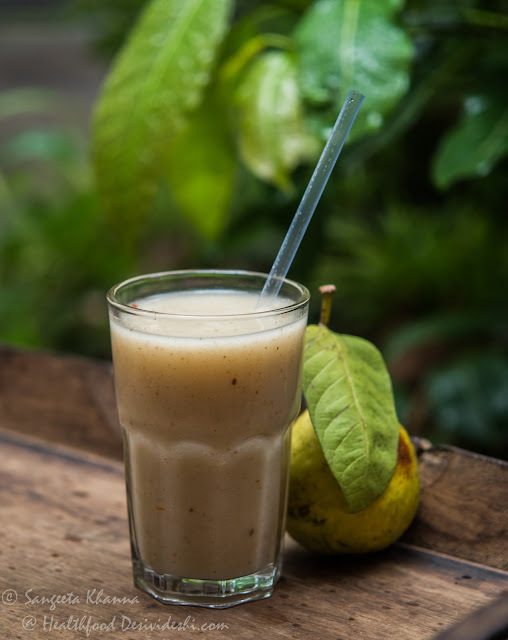 Raw or ripe guava juice is an excellent digestive aid when mixed with ginger juice and black rock salt. Some paprika and ginger powder also taste great in this juice. 3. 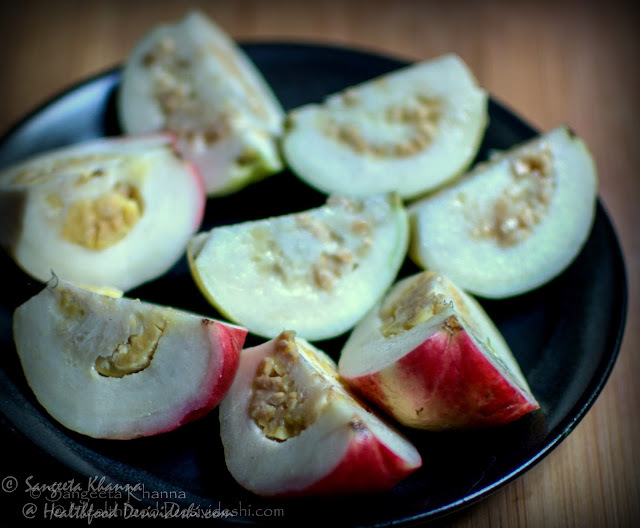 Ripe guava makes delicious fruit chat that helps cure constipation and digestive issues. The fiber in guava is great as a prebiotic agent that helps improve gut flora. 4. 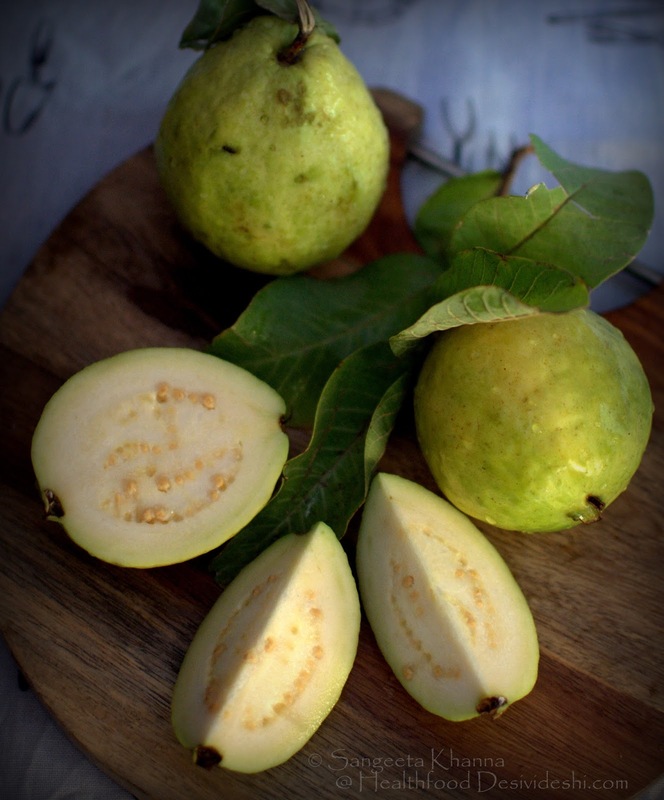 Ripe guava can be cooked either by roasting, boiling or grilling and be made into chutney, salsa or guava soup that helps treat chronic throat and chest congestion. For long standing congestion one may need to take the soup like a medicine dose twice daily for a week or so. (tried and tested on allergic type congestion). 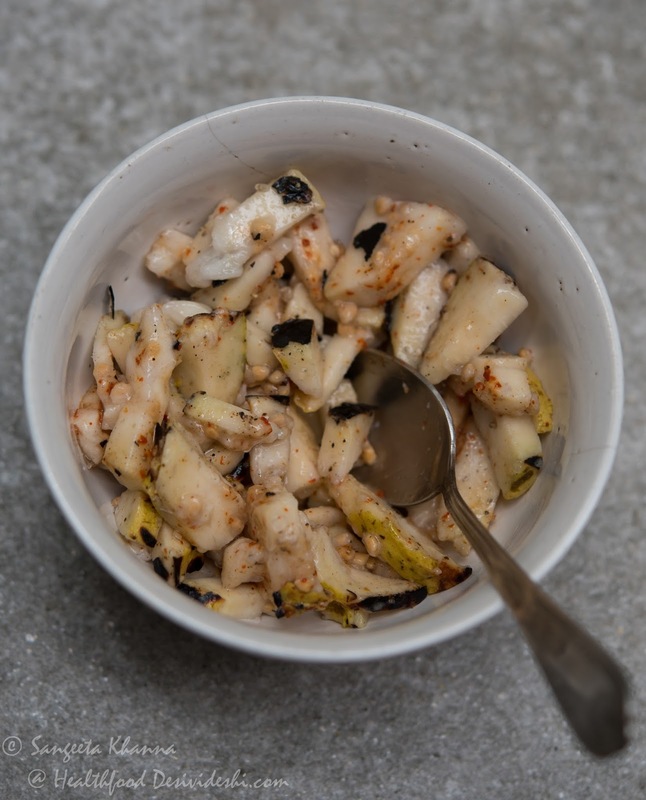 This roasted guava relish is made after roasting the ripe guava on open flame, then chopping it. It is then mixed with pink salt, pepper powder, ginger powder, chilli powder and a hint of sugar. It tastes great as it is for a snack or served with some crackers or fritters. 5. With 381% of daily requirement of Vit C in just 100 gm of guava, this fruit boosts immunity tremendously. So having ripe guavas during changing seasons and during winter is a great way to ward off seasonal infections and keep healthy naturally. 6. Whole guava fruit has potent anticancer activity due to the presence of various antioxidants found in it. (study). According to this study guava peel is the most effective compared to guava flesh and seeds. 7. Vit B3 and B6 in Guava along with Vit A and C help boost immunity, get better eyesight and improve brain function too. Vit B3 and B6 known as Niacin and Pyridoxin help improve cognitive function of nerves. In short, eating guava could improve focus on work. 10. Leaf extract of guava has also been shown good results as anticancer agent. 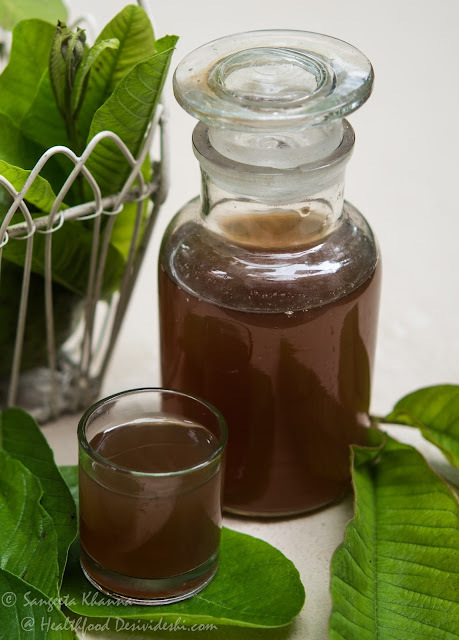 (study) The guava leaf tea could be a good habit to cultivate. 11. Guava leaf extract can even be used to prolong the shelf life of ripe fruits like banana (source). This method can be useful for the industry as a natural way to increase the shelf like of fruits and can reduce the use of chemicals. To make the fruit wash, 250 gm of guava leaves are boiled with 500 ml water for 30 minutes and the filtered extract is used to brush fruits. 12. The astringents in guava leaf extract help tone up the skin if applied daily. It will help kill any microbial activity on the skin as well, healing minor wounds. 13. The tender guava leaves can be chewed on and can be swallowed too. It helps making the gums healthier, kills any minor infections of the mouth and is a potent anti cancer agent as well. Try this if you smoke a lot, it helps minimize the urge to smoke. Do we need more reasons to eat guavas? May be planting a guava tree nearby will be helpful too as the leaves will be available even before the fruiting starts. What a wealth of information. And the simple but perfect recipes. Thank you for writing this,Sangeeta. Guava leaves are also traditionally used for brushing teeth. Yes guava leaves are great as a teeth cleanser. The tender twigs of Guava are also used as a datoon, an old way of making the twigs into toothbrushes. I like it raw - off the tree - my faorite fruit. Sometimes I like it with char masala or salt & red chillies - but it is great as it is on the tree. Guava just plucked from a tree is a luxury :-) I have spent time sitting on guava branches in childhood and can understand what you mean. Thanks anuradha. Very nice article. How good is it to consume dried guava in the form of fruit leather?